Hi everyone and I hope your week has been tremendous. I stayed home on Wednesday due to a snowstorm forecast which eventually missed us. Hubby and I stayed indoors after grabbing a light breakfast. My pregnancy has made me extremely picky in my choice of foods. I shy away from meat, and fish. Some days, I crave for mangoes as you may have noticed on my instagram feeds. Lately, I have been obsessed with a Nigerian delicacy called moin-moin (bean cake). My food cravings aside, emerald green is emerging as one of my favorite colors...maybe because it also happens to be my birthstone. 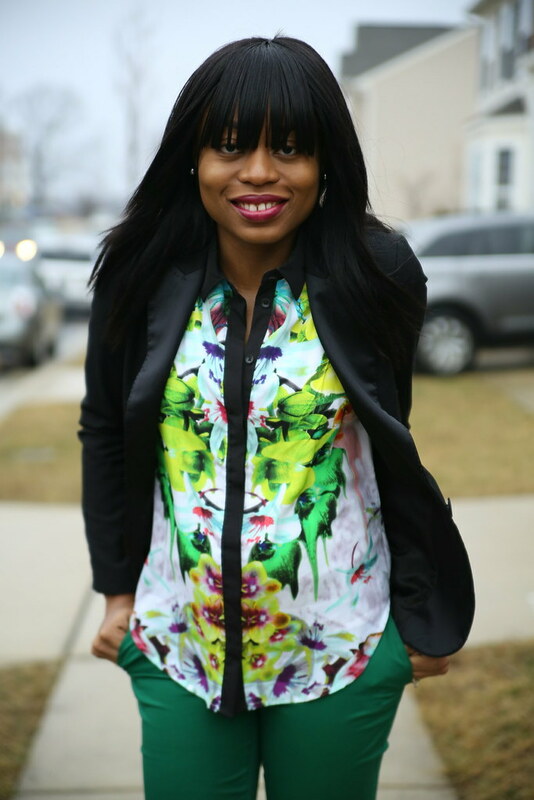 During the week, I wore my emerald JCrew pants paired with a floral emerald blouse to work. The blouse is from the “Prabal Gurung for Target collection”. It feels like spring is taking forever to get here so I am bringing spring colors to you. I paired the outfit with a black blazer and pumps to remind myself that it is still winter (a subtle effect on the overall look). You look so pretty pregnant. Love the ankle editor like pants. I have one in orange and I cant wait for Minnesota weather to behave so I can wear them. Have a good weekend, Stella..
Great top and you look glowing. Beautiful! Stella, you are getting more gorgeous as your pregnancy advances...:) I love how you styled the Prabal Gurung top, I was waiting for it to get warmer to wear mine but I think I might just bring it out. Gorgeous look Stella! I love the emerald pants as well as the yellow nails!! This is so cute! I love this color on you! Very stylish mommy to be. You look amazing in green. Stella, what brand is your yellow nail polish? I love it. Love ur outfit. The prints on d shirt are soo cute. Ps. I need to learn how to 'blow a kiss' to d camera n all. U do it so well. Loll. The blouse is uber pretty! you look just gorgeous Stella!! I really love your exotic shirt!!! You look soo cute! Those emerald pants and yellow nails are gorgeous! These pants are such a great color! Those pants are such a good color! I almost never wear green, but I would wear those pants! You are always on point ! I guess you knew that already . Thank you all so your amazing comments! @DaFashionFreak: Great memories :) I remember the post. 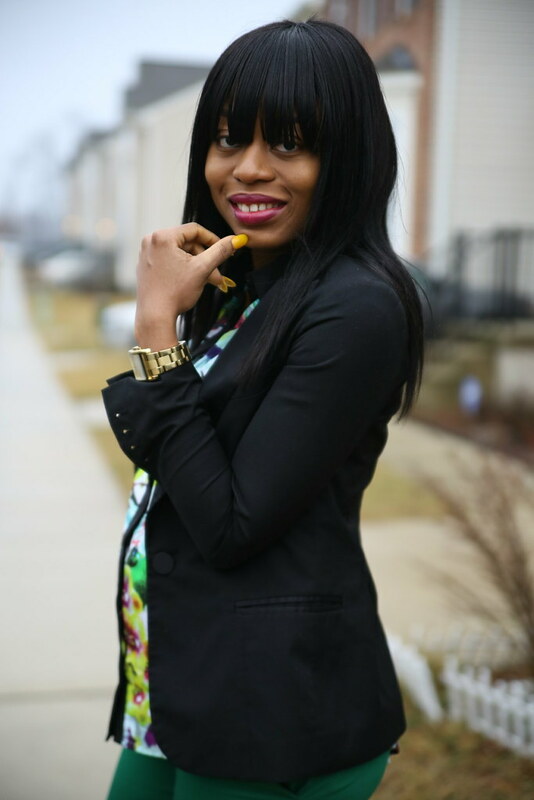 @Oluwaseun & Jewel: I still can't believe I survived Minnesota crazy cold weather. Miss it a bit! Gorgeous and adorable outfit dearie! You make pregnancy so beautiful you're glowing great look! The colour combination definately looks great. And with all the styling u do, I am at peace when I get pregnant. I have tips from u on how to look chic even whilst pregnant. Lovely! ah obsessed with that top...and the pants for that matter and the blazer just polishes the whole look off!! Fab Combo.. you always look great! Love your pants. You look really nice. you are such a beautiful pregnant woman. I love the outfit. I was looking at the top the other day and debating on whether to get it or not. It looks amazing on you.